Gordon's Express Coaches were discontinued years ago, and a demand for them to return is starting to form. They eventually brought back the Salt Wagon. 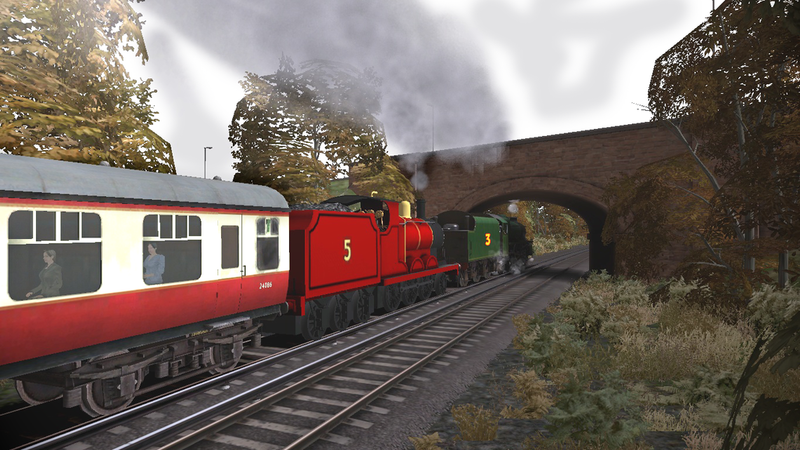 If they ever do return, Gordon will finally have his proper coaches again. Yeah, I would love to see both versions of the express coaches reintroduce. However I would hope they keep the same tooling and not updated them to the terrible CGI design. I also liked their old paint scheme. I know people say it isn't TVS accurate, but I still really liked it. While Rusty was a nice surprise, I still believe that Sir Handel and Peter Sam would make logical choices for next year. Personally, I think they should do both of them together at the same time and skip making an engine in HO. Seeing as how bulky the HO range is with over 20 engines to choose from, I don't think that would be a bad thing. But if they had to choose just one engine, while I personally prefer Peter Sam, I think Sir Handel seems to be the more popular request. Either way, Bachmann has a gap between Rheneas and Rusty which makes it all the more evident that the demand for Sir Handel and Peter Sam will be hard for Bachmann to avoid. Some new wagons wouldn't be a bad idea either and I think they would be great additions if Bachmann wants to focus more on the mining theme that's mentioned in promotions for the range. I also think these should be made in place of the Peco wagon in the range as it would not only be cheaper (as proven by the slate wagons) but they would also be much stronger sellers. There's a lot Bachmann could do with them like giving them different loads (like coal or stone) or even making them in different liveries giving Bachmann a lot of possibilities to work with. However, the one piece of rolling stock that should be announced alongside coaches or new wagons as a bonus should be a brake van. The people who would want this for their collection, would most likely buy more than one, myself included. Unlike the slate wagons and the stock I suggested, Bachmann only needs to make only one brake van (as the brown one is the only one in the CG show) and it will sell like crazy on its own. Overall I think if Bachmann pull off both Sir Handel and Peter Sam for next year with some of my rolling stock suggestions next year, I really think it would be give the range the development and sales that it really needs. It may seem like a lot, especially with how only Rusty got announced this year, but keep in mind that Bachmann has made big comebacks before with HO and large scale therefore it only seems only fair that narrow gauge gets a chance to shine, while paying off strong sales in the process. Which engine do you want to see made next in narrow gauge? Is there a specific order you would like Bachmann to release the rest of the narrow gauge engines? What rolling stock would you be most interested in? Would you also be in favor of an engine being skipped in HO next year so they can do two narrow gauge engines next year instead of just one? I'm pretty certain Bachmann won't be making narrow gauge engines in numerical order now, more likely we will get Duncan. Hopfully they do not make Freddie or Luke before they finish the classic characters. That's a fair point and all, but really if they sell similarly to how Skarloey does it only further proves the point that the range could really benefit from more development. Some new wagons wouldn't be a bad idea either and I think they would be great additions if Bachmann wants to focus more on the mining theme that's mentioned in promotions for the range. That is an extremely good point that I'm sure Bachmann hasn't even thoroughly thought through. Whenever Bachmann talks about Skarloey (as he's the only one out, but I'm sure if Rheneas was at shows to present, he would be given the same description) They mention the Quarry. I would really like to see the wagon Chaz posted, in a few colours, such as red, green, and maybe an offset yellow or bright tan just for a little diversity to the range. We'd most likely only get one tooling of an open wagon, as they're going to get recoloured several times as we all can expect, so, as long as they don't suffer the same fate as the slate wagons, I wouldn't mind at all. "Do you want the blue truck or red truck?" "I want the blue one"
"Would you like the one with the number 101 or 164, or do you want the one with no number at all? But it doesn't matter which one you pick kid, because they all look the same anyway." They would look at it and wouldn't know the difference unless they have a magnifying glass. So I'd much rather prefer different colour over a running number, especially if they produce the BMQ ones where there's a logo, as that would be more difficult to paint around, as if you really want to make Talyllyn wagons, you can just get some transfers and do them yourself. I know there are more but these are top of my list. The reason why I didn't mention Duncan in my post, isn't because of him being last in numerical order, it has to do with his CG render. The biggest reason why Skarloey is still selling like crazy is because of how close his CG render is compared to Talyllyn and why Rheneas wouldn't be any different. Those same sales will follow through moreso with Sir Handel and Peter Sam than Duncan because of how close their renders resemble their original basis. While Rusty's CG render doesn't match his basis all that close either, I feel like his simple "box" design will win a lot of modelers over and his chassis would be great for other projects 009 modelers would look into. 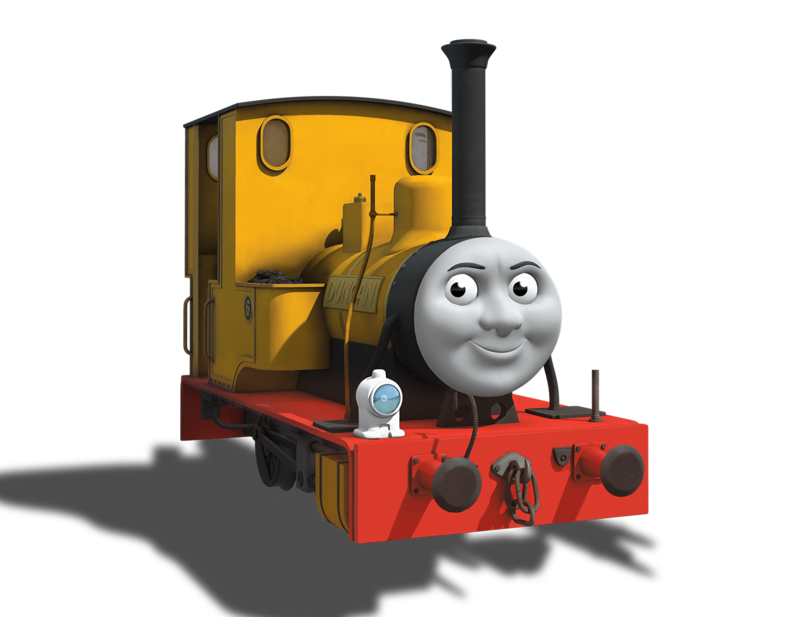 Duncan is where it becomes a lot more questionable as it doesn't even resemble his original character or basis all that closely as Arc did a poor job of making his render, (probably their worst render that they've ever made...). Compared to Skarloey or Peter Sam, Duncan's render looks incredibly plain with proportions off in several areas. Even though he might make sense based on color contrast and his recent starring roles, his sales would be very minimal compared to Skarloey and Rheneas'. So while I wouldn't rule him out entirely after Rusty's announcement, I would much rather see Bachmann do Sir Handel and Peter Sam first, unless we are lucky enough to see his render upgraded (as unlikely as that sounds). Regarding Jesse's earlier post, I absolutely agree with you on those wagons too. They seem a lot more colorful and would attract sales and also win Mattel over by a long shot. Admittedly, I prefer the wagons I suggested earlier, but those wouldn't be a bad alternative. Sadly with the promotions of the range talking about mining, I almost wonder if that's why they haven't bothered to make narrow gauge coaches yet. A real shame since as noted in my earlier post, they would sell like hotcakes. Hey Tranfan97! This wasn't meant to be a wish list for 2018 but rather just what I think are the more important ones that Bachmann needs to consider producing sometime in the not too distant future. I would actually like to see a lot of these on my railroad before I die so please Bachmann hurry up so I don't expire before you get around to making these. Sorry about that. It's just that many of these may never happen, especially items related to Misty Island, as anything related to that island is heavily disliked by the fans. These are models I'm hoping to see in my lifetime. I'm trying to be realistic. Well i figured I might as well make an actual list this time around. I know most of this is wishful thinking and that we definitely won't get all of it during 2018 but it's what I'd like to see. Hey Trainfan97! All good choices also. With as many Thomas Engines as there are you would think that Bachmann would bring out several each year. I was told they didn't think something big like the Steamworks would have enough sales to make it worth their investment. Guess it all comes down to money as it usually does. The buildings I can probably scratch build but I'm out of luck when it comes to the engines and railcars. Too bad Bachmann is so spread out that with so many irons in the fire that they can't concentrate a little more on something fun like Thomas.. Ruined? How so? What is your complaint? I wasn't trying to ruin it.